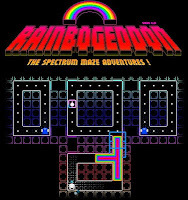 Rainbogeddon The Spectrum Maze Adventures is a new maze munching game from one of our favorites, nitrome. In this game you drill through the level with the drill attachment, create protective bubble zones to hide in, teleport away from enemies with teleporter placements and more cool stuff. The gameplay is like pacman in which you munch on pixels while you avoid monsters through different maze. What's more cool in this one is that you can counter attack monsters with different power ups popping around like bombs or avoid them more effectively using bubble shields and teleporters. The gameplay is smooth as all other nitrome games and levels becomes more challenging as you progress. Meanwhile, here is Rainbogeddon walkthrough which also shows the ending for those who need it.